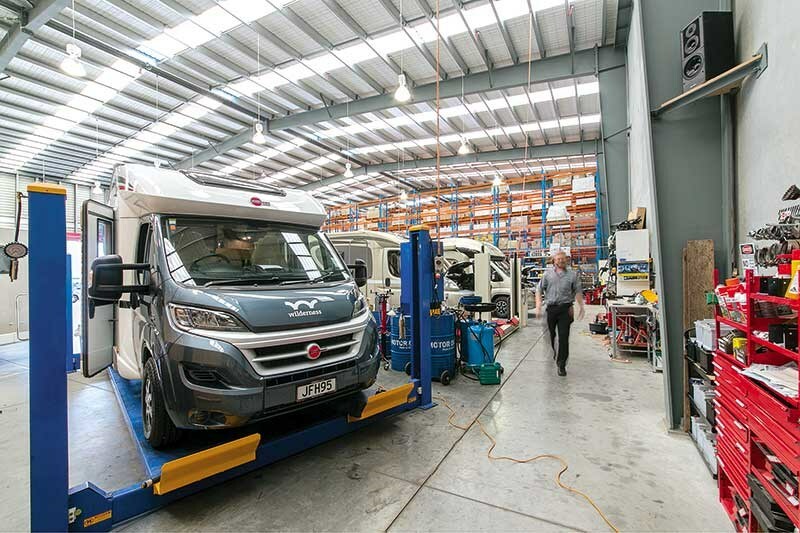 Ensuring your motorhome is always in tip-top condition and ready for your next adventure can help avoid major breakdowns and save a lot of stress, hassle and money. Patrick Frick joined the team at SmartRV in 2010 after moving to New Zealand from Germany. Patrick did his apprenticeship at Mercedes-Benz in Stuttgart and was trained at the Bürstner and Hymer factories. He has experience in working on all makes and models of motorhome and is a certified self-containment officer. He answers a few common mechanical questions about motorhomes. How often should I check/change my motorhome’s oil? You should check the oil level of your motorhome every three months or before and after any bigger trips. Remember to make sure the engine has cooled down before checking the oil level. Also keep an eye on the oil consumption. If your motorhome starts using more oil than usual it might be worth having it checked out by a workshop. When topping up the engine oil, be sure to stay above the minimum and below the maximum mark on your dipstick. Never top up more than 500ml at a time without checking the level. You should change your engine oil at least once a year even if you didn’t do a lot of mileage. Distance recommendations vary hugely between manufacturers and models, so refer to your motorhome’s owner’s manual or manufacturer if you’re unsure. Make sure you use the correct oil for your vehicle. Using the wrong oil can do damage to your engine or void your warranty, so do your research beforehand. You will find this information in your owner’s manual. What do I need to know about caring for my battery? If you park the vehicle over a longer period, disconnect the batteries and put them on a multistage charger at least once a month. This will extend the battery life significantly. Never drain your batteries below 12V. Every time you do it shortens the life of the battery. If your battery gets deeply discharged it may also cause irreversible damage to the battery. Installing a solar panel will trickle charge your batteries and will also increase your freedom camping capabilities. Remember, if you are using wet batteries, check the battery fluid level regularly and only top up with distilled water. How often should I have my motorhome serviced, And what’s involved? At least once a year, or when you reached the recommended distance. Again refer to your owner’s manual if you are unsure what this is. 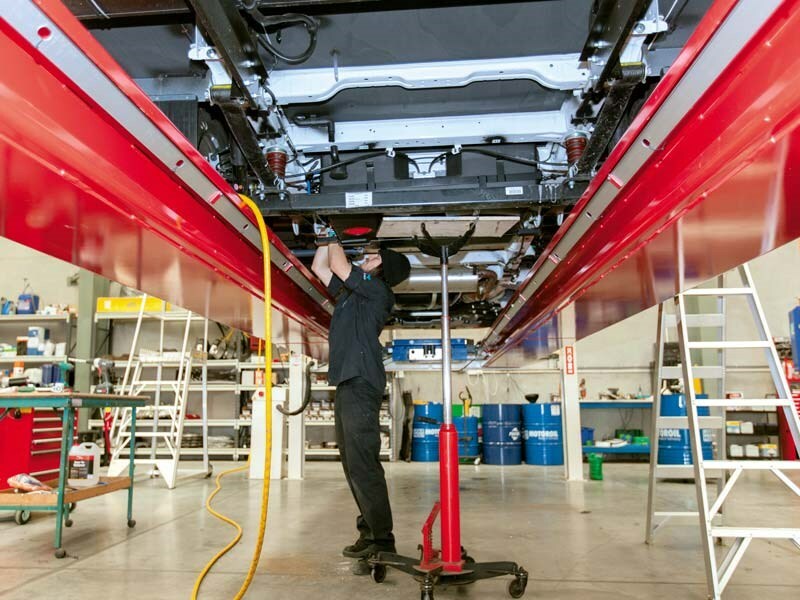 A service should always include a full safety check of the vehicle including brakes, shocks, wheels and tyres, suspension, mounts and under-body. 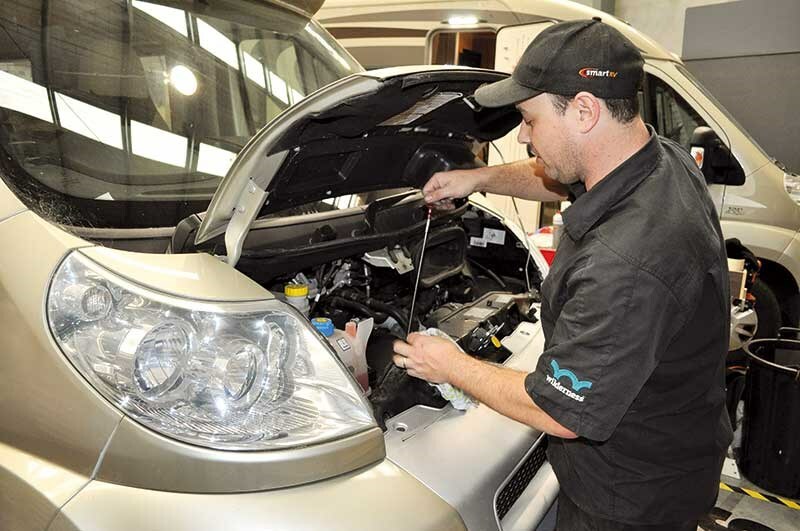 all fluid levels, wiper blades, tyre pressure as well as a test drive and a reset of the service indicator. Your service may also include a full diagnostic scan of all systems, plus a change of brake pads, air/cabin filters, fuel filter, coolant, brake fluid, transmission oil etc. Your workshop should advise you about any defects they found or things you need to keep an eye on. My motorhome seems to be a bit ‘gutless’, what can I do? First off, check if there are any warning lights on in the dashboard. If so, have this checked out by a workshop. There might be a simple reason such as a blocked fuel filter, air filter, or diesel particulate filter. Injectors can also be a common problem that will reduce the performance of your motorhome. 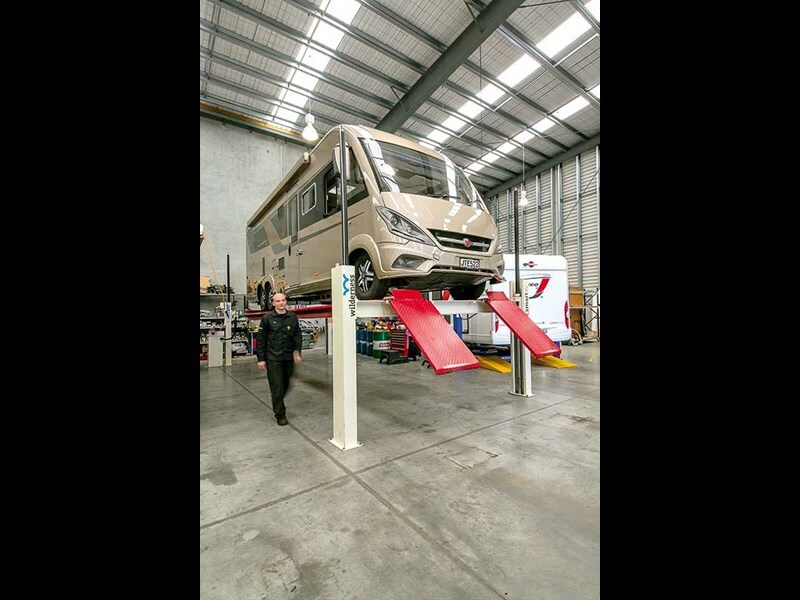 On most modern motorhomes, a diagnostic check will diagnose the problem. Reprogramming the engine control unit (ECU) or installation of a different chip might be another option if there are no faults with the motor home but you still want better performance. Be aware however that this might void your warranty. 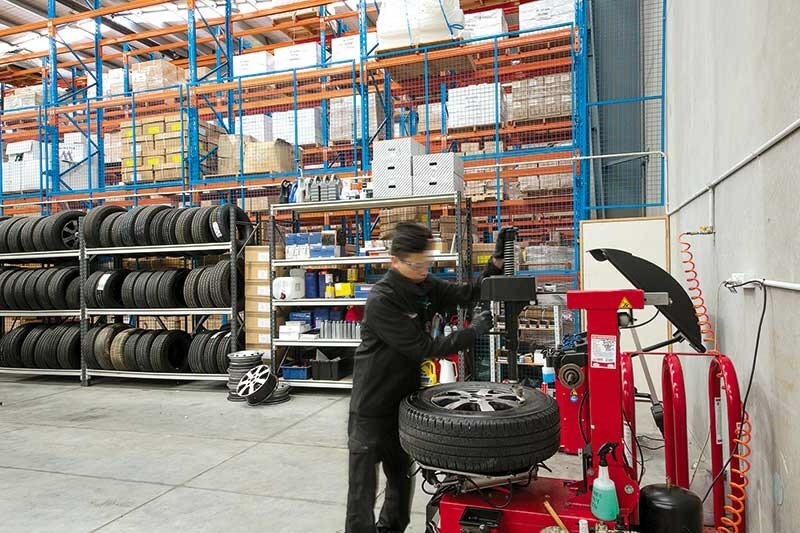 How do I know if my tyres need to be changed? Start by checking the tyre tread depth inside, outside and centre. Although the legal limit is 1.6mm, I would recommend changing the tyres at 3mm. Check your tyres for any damage, nails, cracks etc. Also check the age of the tyre. You should not use any tyres older than seven years. The date is printed on the side wall, for example 1008 would mean the tenth week of 2008. Be sure to use the same type of tyres per axle. If you have a 4WD vehicle, make sure all four tyres match. When I start my motorhome, there’s a cloud of smoke. What causes this? Blue smoke appears when the engine burns oil. This can have various causes such as the oil level being over the maximum, worn piston rings etc. The other warning sign is white smoke. If there is a big white cloud behind you on a warm engine it is generally water/coolant in the exhaust gases and could indicate a worn head gasket. What fluids should I be checking regularly? Keep an eye on your levels of oil, coolant, brake fluid, power steering fluid and windscreen wash. Coolant and power steering fluid level loss indicates a leak in general. 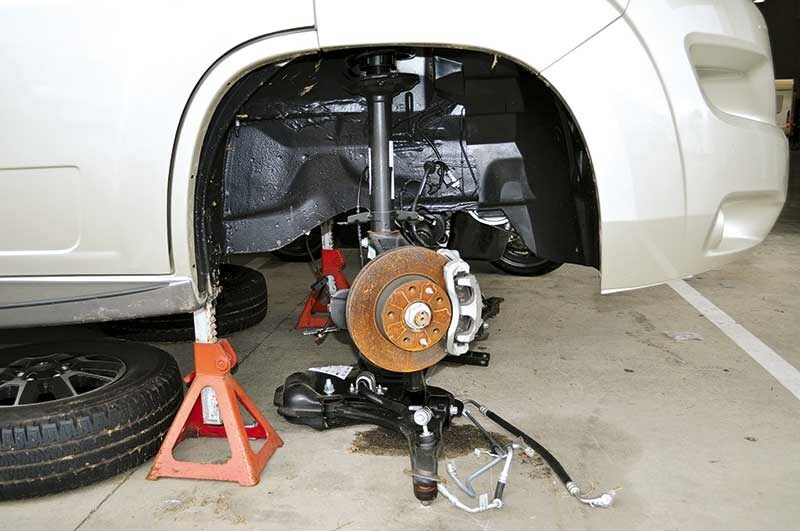 A low brake fluid level might indicate wear of brake pads and rotors. What tools or spare parts should I keep on board? It is always good to have some spare fuses and light bulbs on board. If you are going on a bigger trip you could also take engine oil, a tyre pressure gauge, screwdrivers, pliers, rags, a spare wheel and jack, gloves, wheel spanner, a couple pieces of timber in case you need to jack the vehicle up on grass or snow, windscreen washer additive and a multi-meter.